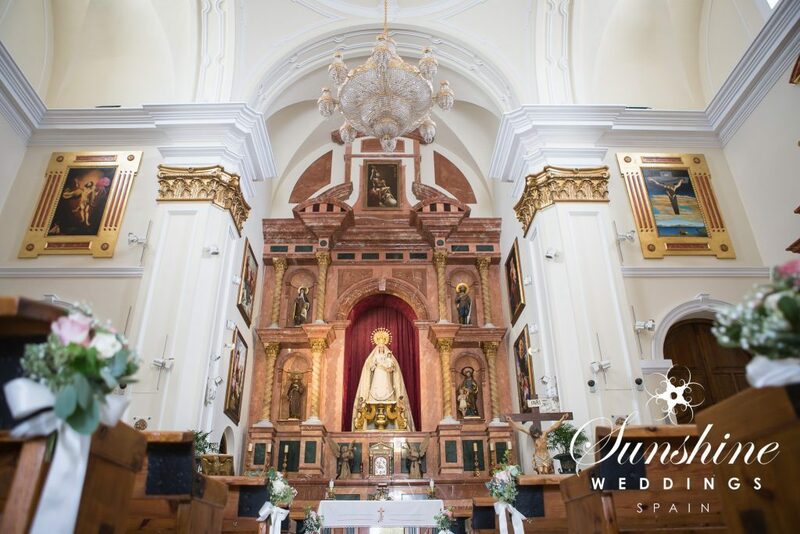 When our bridal couples discuss with us the idea of marrying in a church in the south of Spain, many wonder how they will find their perfect chapel or church. They don’t want a remote village far away from the fun and neither do they want an obscure church in the centre of a bustling tourist destination, most are searching for that rare combination of a quintessential Spanish village with plenty of options for hosting their wedding party nearby along with a choice of guest accommodation. Luckily we work with the most picturesque and beautiful of churches on the Spanish coast and know just what will suit each couple. Just a twenty minute drive away from the glamour of Marbella is Estepona. Once a small fishing town, it is now affectionately known as the ‘Garden of the Costa del Sol’. With its typical white-washed ‘pueblo’ village, cobbled streets with pretty houses bedecked in colourful flower pots and bright geraniums and of course plenty of charming squares in which to enjoy a refreshing sangria, Estepona is the perfect place to marry. Getting married in a church in Spain is not as complicated as one may think. Of course there is always the option of marrying back at home and having a blessing in the Spanish church, or our team can help you with the paperwork so that the moment you say ‘I do’ in the house of God is the very moment you become husband and wife. There are a number of churches you can choose from in Estepona, the most popular being ‘ Nuestra Señora de Los Remedios’. Its yellow and white tower stands proudly above the Estepona skyline and has been adopted as its emblem. The church is perched high on a hill, deep in the centre of the pueblo, surrounded by a cobbled courtyard and a wonderful view over the town. Inside, the glowing golden altar and majestic arches lend themselves perfectly to any wedding – with plenty of pews to seat over a hundred guests. Documents dating back to the 4th century claim that a church has always stood on that spot, but the church that we see today was first built in 1473 as the church within a fortress…and is the oldest known church in the district of Malaga after the Antequera. It has since had many renovations, the last being in 1880. A statue of the town’s favourite priest Padre Manuel sits outside, a much revered man that in the 1930’s opened schools and hospitals in the area to attend to the poor. There are also smaller chapels to choose from and plenty of churches from various denominations so do ask our team for more information if Estepona is your chosen destination. If you wish to continue your wedding celebrations in the same town, we offer some amazing hotels and villas or alternatively there are a great choice of beaches, bars, restaurants and sea-view venues nearby. All in all, marrying in a church in Estepona is an experience like no other. You have the quaintness of the old Spanish white village, the adjacent beaches and of course the stunning ‘Nuestra Senora de Los Remedios’. The churches alone are enough to make you say ‘I do’ to Estepona.